As an automotive enthusiast, one of the things I look forward to each year is reviewing and driving the new crop of vehicles. Manufacturers continue to up the ante with regard to performance, capability, fuel economy, navigation systems, electronics, and creature comforts. While first public appearance usually takes place at one of the big auto shows—New York, Los Angeles, or Detroit—there is often a preview venue known as a “backgrounder,” a small gathering of journalists and industry influencers. Cameras are strictly prohibited, and cell phones must be checked at the door. 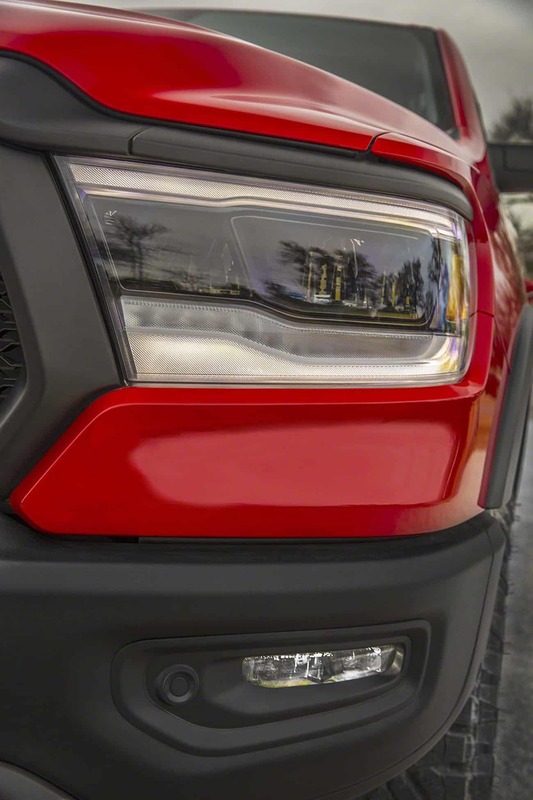 Last month I joined the team from Ram Truck in the FCA “dome” in Auburn Hills, Michigan, to grab our first glimpse of the long-awaited 2019 Ram 1500 lineup. Although we did not get to drive them, it was evident that they spent a lot of time at the proverbial drawing board on this one, addressing each of the aforementioned attributes with purpose. 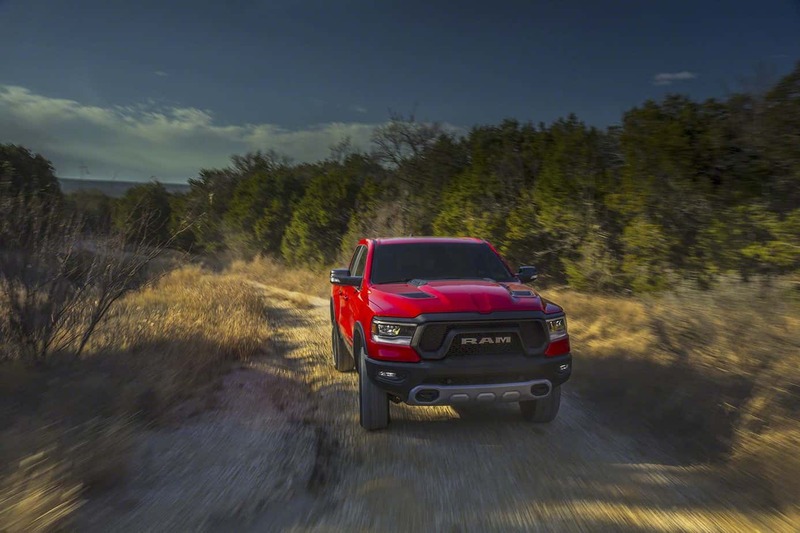 Starting from the ground up, Ram developed a completely new chassis. The majority of it is formed from high-strength steel, which improves rigidity while contributing to overall weight reduction. 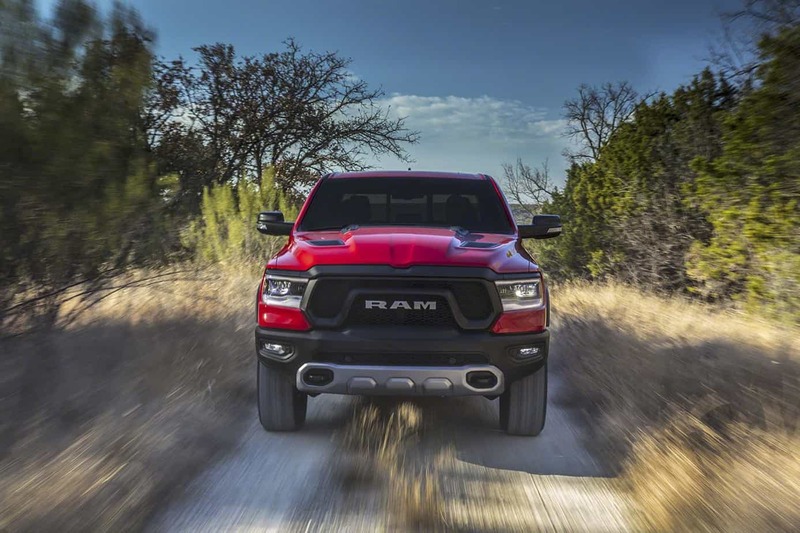 The front clip has also been redesigned with what Ram calls “splayed frame rail technology.” It is designed to create energy-absorbing impact zones which, combined with tire blockers near the footwells, diverts potential threats away from the occupants during a collision. Other weight-saving components include composite and aluminum control arms, aluminum center and forward crossmembers, and engine mounts. The aggregate reduction in mass for the chassis alone is 100 pounds. The rear suspension is an updated five-link configuration with progressive coil springs, and up front are newly designed coil-overs. The frequency response damping (FRD) shocks, combined with their new air suspension, should provide better handling, performance over uneven terrain, and ride comfort. It also features auto load leveling for when you mount a camper or stow other heavy gear in the back. While the 1500 will still land in the half-ton category, the maximum payload has been increased to a whopping 2,300 pounds (nearly 1.25 tons), and towing capacity pushed up to 12,700 pounds. The Max Tow package features a Dana Super 60 rear axle with 35-spline shafts; unfortunately, it is only available on 2WD models fitted with a HEMI. 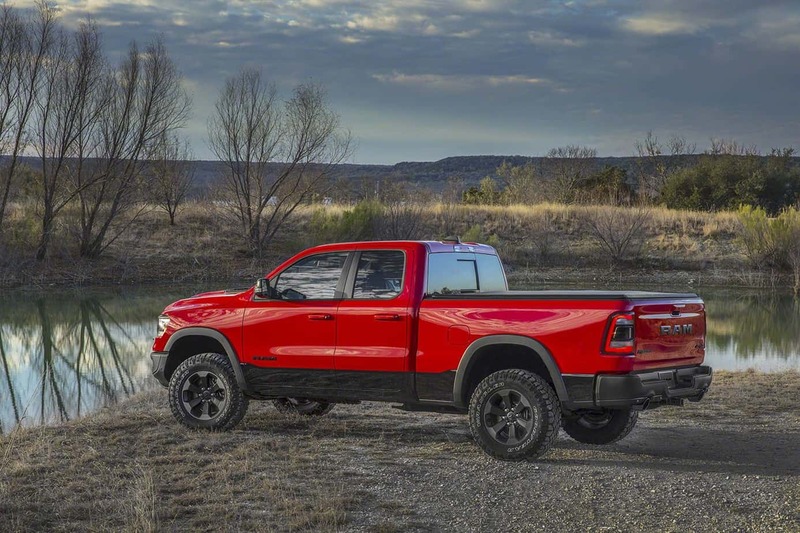 The Off-Road package, available on all models including the Rebel, will feature a 1-inch lift, hill descent control, performance-tuned shocks, and an electric locking rear differential. Locking differentials are one of the things we love about the Power Wagon, and being able to order one on a 1500 is a big plus. The rear axle will also sport thermal management, which will quickly warm the gear oil and reduce component wear. 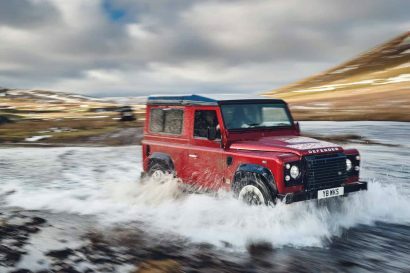 Another below-the-cab change for 2019 is that all models have adopted a six-lug wheel. Braking has been improved by the addition of 14.9-inch rotors. While this will enhance safety, the downside is that it increases minimum wheel diameter, which becomes challenging when you need to air down the tires during technical trail work. Wheels will be 18 to 22 inches in diameter and available in 16 styles. Last year, I drove a Rebel Mopar 16 Edition up the Arctic Ocean on the Ice Road (8,000 miles round trip) and I can say it was exceptionally comfortable to drive. 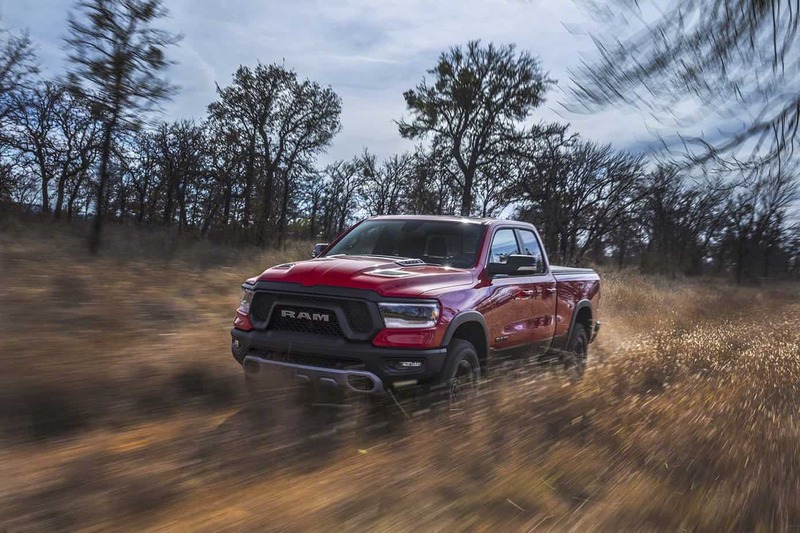 But Ram has taken it up a level with a number of creature comforts and electronic wizardry that should make the driving experience that much more sublime. As is the case with many trucks these days, the new 1500 is longer and wider. While bigger is not always better, this move has allowed for some improvements to storage and ergonomics. From the comfortable leather driver’s seat, the instrument cluster is in clear view and provides all necessary data. There is a lot of real estate between the windshield and front bumper, but visibility is quite good. Considering our group consisted of some hardline automotive critics, all were amazed with the Ram’s new multi-compartment console. It is literally big enough to fit a large pizza and deep enough to stow a case or so of coldies. Overall cab length has been stretched by 4 inches, much of which is dedicated to the real estate aft of the B-pillar. 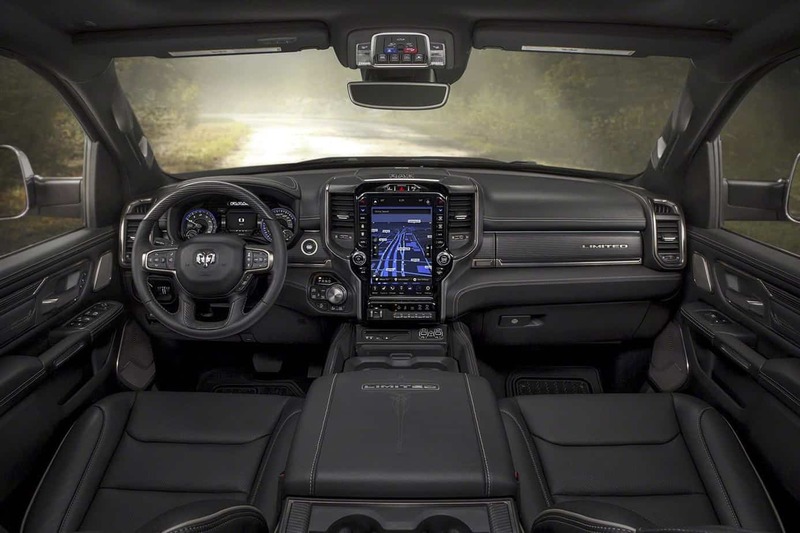 To address concerns with loading gear behind the seats, Ram’s engineers managed to lower the transmission tunnel and make the rear deck completely flat. Expanding the cab length also allowed for the new reclining rear seats. I found the back seat quite comfortable for my 6-foot frame. Add the rear underfloor RamBins and other nooks and crannies to the console, and you’ve got over 150 liters of storage space. There are also several tie-down attachment points on the floor, handy for securing loose items. Delving into electronic wizardry, the Gen IV Uconnect system features an optional (and unprecedented) 12-inch touchscreen that can be set to a split screen configuration to run multiple applications simultaneously. 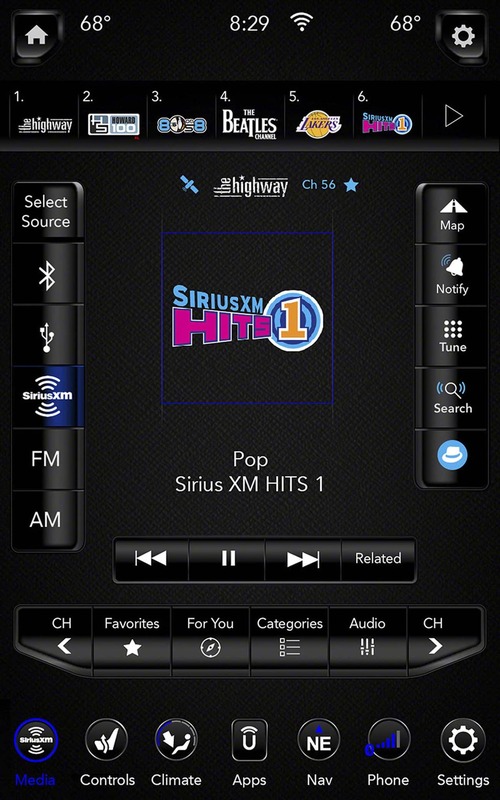 New to the Sirius XM radio is 360L, giving occupants a wider variety of listening and on-demand audio choices. For the true audiophile, the premium package includes a 900-watt Harman Kardon system with 19-speaker surround sound, active noise cancellation, and a 10-inch subwoofer. We may not have driven the 1500, but I can tell you that the audio system rocks the kasbah. 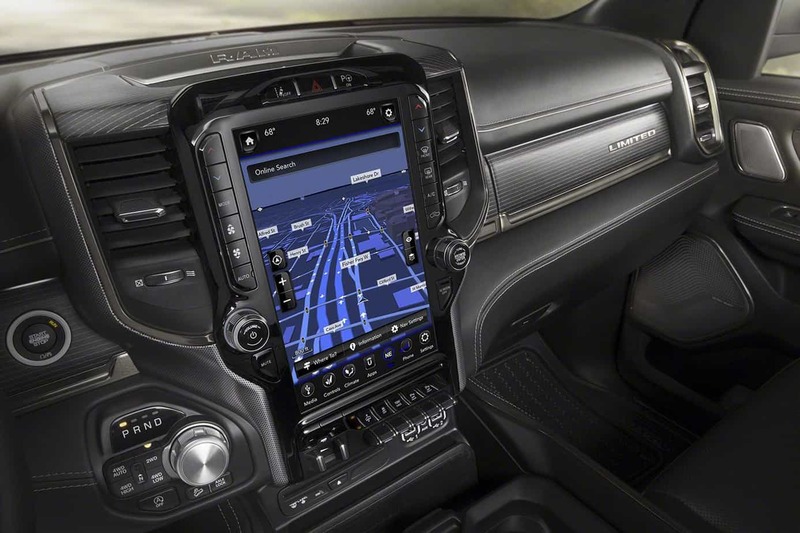 The enhanced 3D nav system allows for voice control, and the Android Auto and Apple CarPlay will put your iPhone or Android in full display on the Uconnect screen. In our world of hungry electronic gadgets, the 1500 has us covered. There are more ports (three of which sync with the Uconnect system) and 12-volt power points than I can imagine I’d need, and the optional wireless charging pad is an added bonus. All are connected to the world via a new roof-mounted “shark fin” antenna, eliminating the traditional fender-mounted mast type. The list of electronic safety features is too long to repeat here, but we’ll name a few: adaptive cruise control, forward collision warning, ready alert braking, trailer-sway damping control, LaneSense Departure warning, hill-start assist, blind spot monitoring, 360-degree video monitors, and more. What I found is that while modern electronics do improve safety, they can be annoying if you actually want to drive the car. For example, the brake-throttle override cuts power when the brake and accelerator are pressed simultaneously. This is great for the inattentive driver that doesn’t know which is which, but less than perfect if you are drifting through a high-speed corner in the desert and require full manual control of all systems. Enough said; hopefully, we can pull the plug on these safety nannies when we head for the backcountry. Powerplant options will continue to be the venerable Pentastar 3.6-liter V6 (Gen II) and the 395-horsepower 5.7-liter HEMI V8. What has changed is the way they produce power and manage electronic needs. They now have a mild hybrid regeneration system called eTorque which combines a large, 48-volt battery with a belt-driven generator/motor attached to the engine. During braking, the generator spools up and charges the battery. The stored energy is then used to manage the start/stop feature and short-term torque assistance to the engine. Hmmm, with 48 volts, depending on amperage limitations, one might be able to utilize the battery for trail welding—but I digress, as that is a topic for another day. 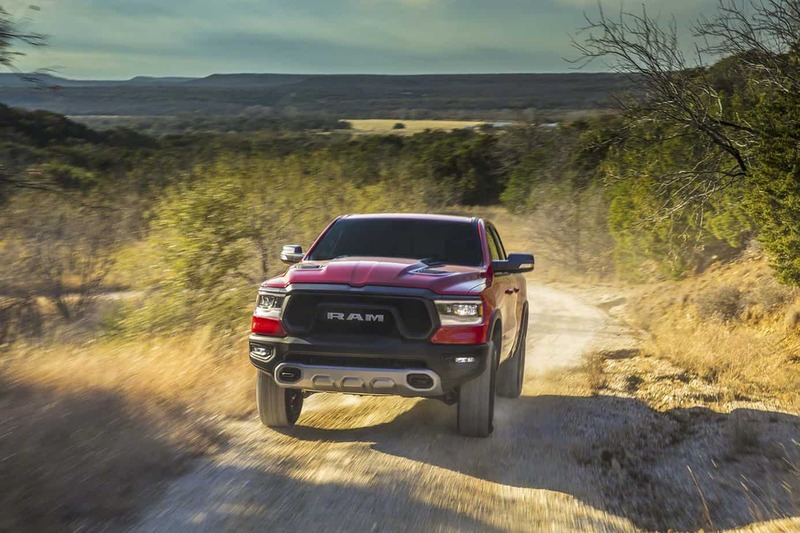 When accelerating, the generator/motor provides up to 90 pound-feet of torque to the Pentastar and 130 pound-feet of torque to the HEMI, thus taking a little load off the engine that in turn sips less fuel. 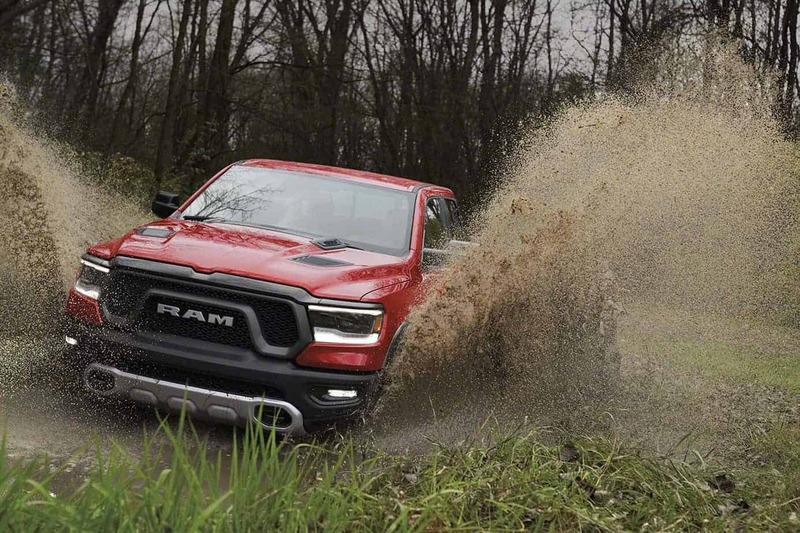 Cylinder cutoff, or deactivation (Ram’s calls their’s Interactive Deceleration Fuel Shut Off (iDFSO)), is not news in the automotive world, but new to the 1500 are two systems that dampen the associated vibration. HEMI-equipped models have active tuned mass modules (ATMM) and active noise cancellation mounted on the frame to reduce in-cab noise levels. Ram states a 67.1-decibel level, but a speed for that rating was not given. Also new for both the Pentastar and HEMI will be next-generation TorqueFlite 8-speed automatic transmissions (trans 850RE and 8P75 respectively). The enhancements have been to the electronics, which will process input data faster and manage the interface between the eTorque system and the transmission. Manufacturers are in a constant race with the EPA and CAFE (corporate average fuel efficiency) regulations. In the process, they become lean and mean, and must stay frosty to survive in this highly competitive game. 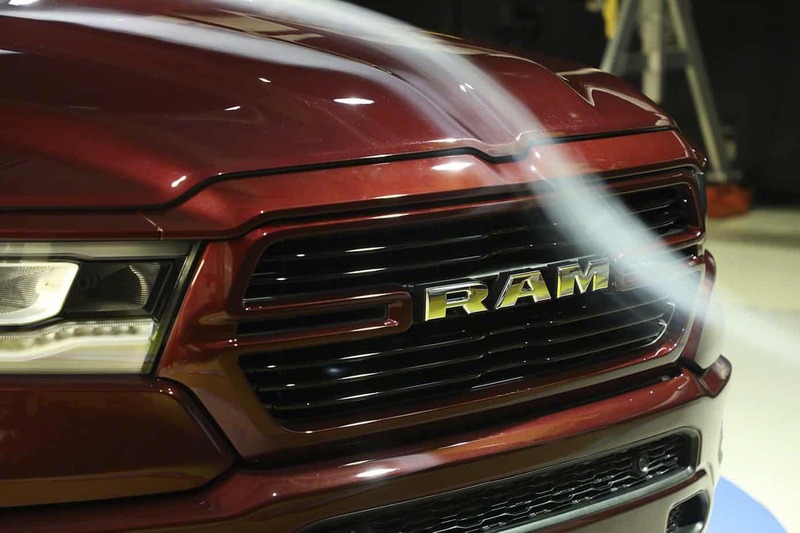 Ram has embraced the challenge and pushed the envelope with this new model. Subtle changes such as improved grille shutters, a retractable front air dam, lighter-weight exhaust system, the move to a number of aluminum body parts (hood, tailgate, etcetera), and an air suspension (reduced ride height on the highway) have contributed to a lighter (225 pounds over the 2017 model) and more aerodynamic platform. The coefficient of drag has been reduced to .0357, which Ram states is the best in the segment. Part and parcel to the EPA/CAFE battle, the auto industry has become a prisoner of the dreaded wind tunnel. 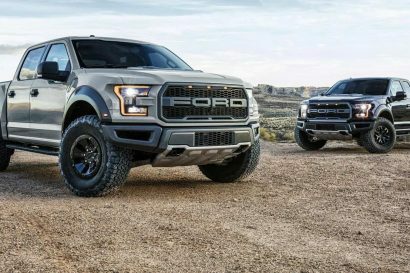 Truck manufacturers face the biggest obstacles, and crafting body lines that don’t resemble a torpedoish soccer-mom-minivan-mobile can be challenging—trucks should look stout and brawny. The 1500 held its ground in this department and looks like a truck should look. In addition to being longer, width has also been increased by .5 inches. The bedrail is now 1.5 inches higher to match the body lines of the new cab design. 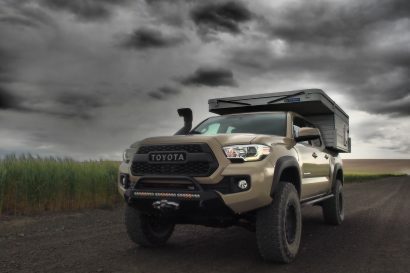 There are fore and aft trail-worthy recovery points, and the full-width steel rear bumper has a lower center section to allow for easier step-in access to the bed. The tailgate has “lift assist” and electronic locking, both of which can be activated from the key fob. The weatherproof RamBoxes are now 5.5 inches longer and feature a 110-volt receptacle and more efficient lighting. Sure to cover just about anyone’s taste are 12 available color options, ranging from Parrott Blue to Black Diamond Crystal. 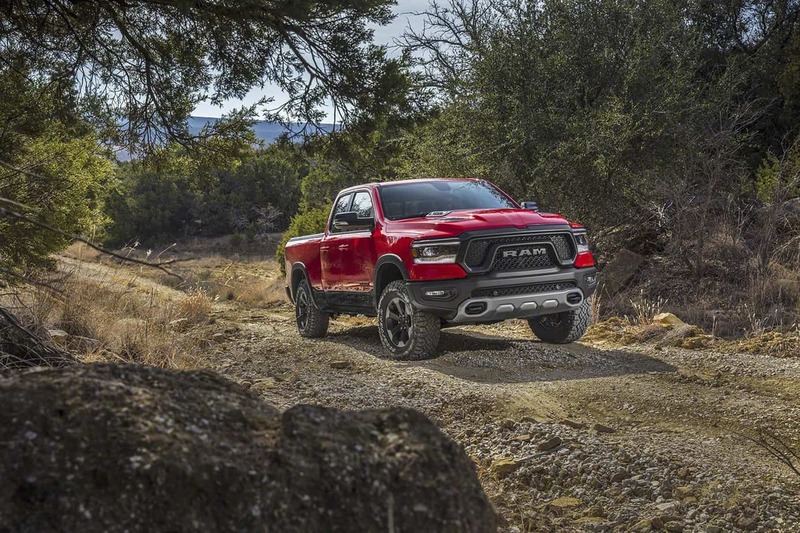 The vehicle is backed by a transferable 3-year/36,000-mile bumper-to-bumper warranty (5-year/60,000-mile on the powertrain)—they will also tow your rig to the nearest dealer if needed. Other good news is that the 1500 will be built at Ram’s Sterling Heights, Michigan, facility in the good-old USA. 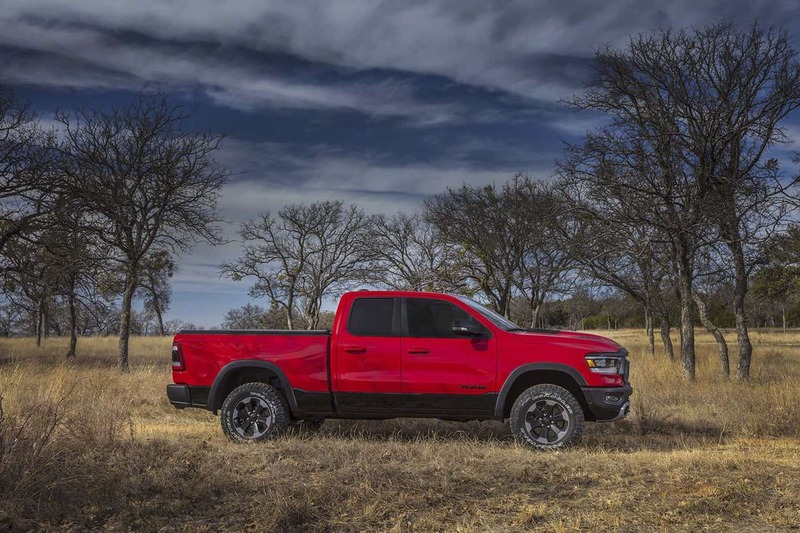 We hope to have some time behind the wheel in the near future and will give you the skinny on our driving impressions of Ram’s latest, the 2019 1500.